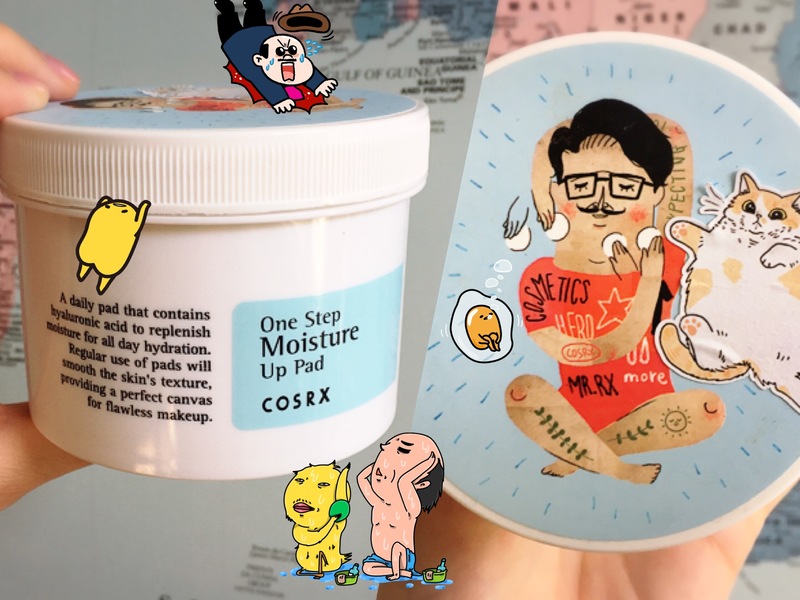 My interest was only heightened by seeing swoonworthy Mr. COSRX on the lid. 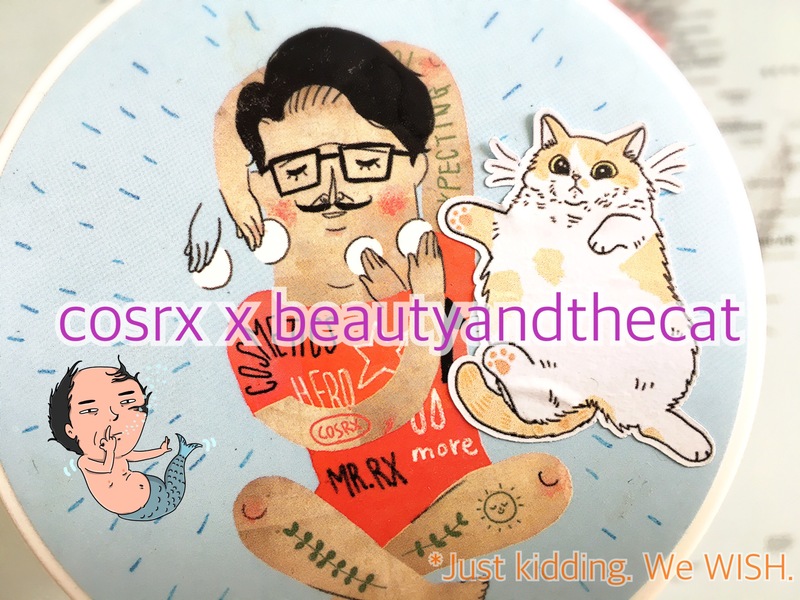 Naturally, this post shows off all my man stickers as much as it does COSRX. I have…just a few of those. Check out @nu1t on Instagram for more manliness. The pads boast two star ingredients: 70% propolis extract and 0.5% betaine salicylate. 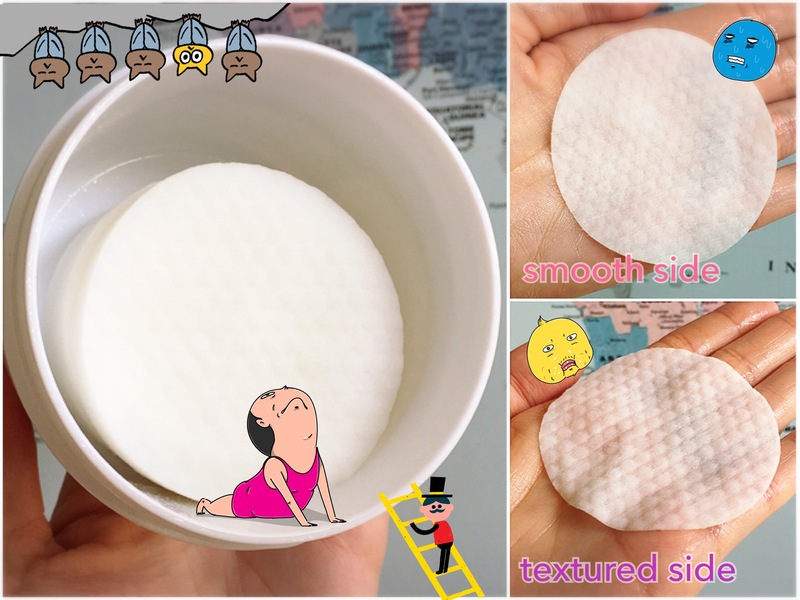 With my dry, redness-prone skin, I love these pads as a convenient and pumped-up hydrating toner but could also see them being used as a lazy morning cleanser. (If only I didn’t love the foam life so much…) With only 0.5% betaine salicylate, they don’t sting or cause flaking (but also don’t do serious pimple-fighting). And being pads, they also exfoliate physically. Amp up the exfoliation by using the textured side or by swiping with more pressure. I have sensitive skin so I only use these 1x/day at most and usually use the smooth side. Sometimes I don’t even swipe. Just press and pat. The pads are pretty big and thoroughly soaked. There’s enough liquid for your neck, chest, and then some! (I swipe my elbows and knees with the excess.) Despite essential oils at the bottom of the ingredient list, I don’t detect much of a scent. The pads leave skin very wet; I can even see the droplets on my skin. The formula is purrrrfect for the 4 Skin–sorry, 7 Skin–Method. I think it’s heavy enough to count for, like, 3 skins. 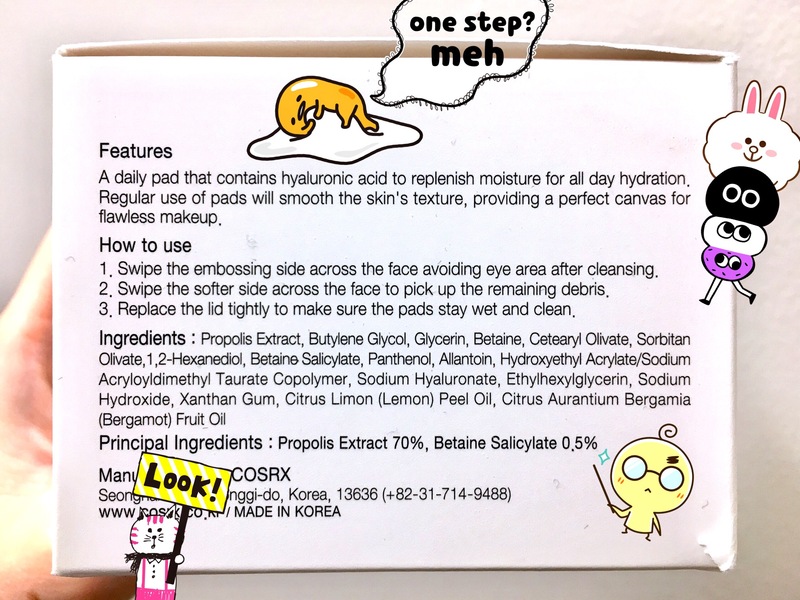 Heavier than toner and reminiscent of sheet mask residue–in a good way. Sadly not as plumping because the pads aren’t on long enough to force the liquid into skin. But they do leave a thin layer that hydrates even after drying down. Of course, I seal this layer of lusciousness in with a face oil or moisturizer. I’ve been loving the combo of COSRX pads + Pestle & Mortar Superstar Retinol Night Oil. Massaging in the medium-weight oil while skin’s still wet creates a smooth and cushiony layer, which I then bury with creams and sleeping packs. Like some sort of luscious layer cake. Pros: Hydrates well and quickly (like 3 skins in one swipe!). Exfoliates physically and (theoretically) chemically. Leaves skin smooth and moist. Cons: Chemical exfoliation might be too gentle/ineffective for thicker skins. Physical exfoliation might be too much for sensitive skins. I look forward to reading about other pads. Are there any other ones that moisturize? Not with this particular review – I am doing the Wish Formula C200 Bubble Peeling Pad (love! ), Nooni Advanced Repair Radiance Turnover Peel Pads and Skyn Iceland Nordic Skin Peel Pads – I recommend using the cosRX ones afterwards. That said, I did purchase ALL THREE OF THE WHASMIA pads, which does have a moisturizing one. I plan to write up a review on those as well – but separately. They had Moisture Care, Pore Care and Sebum Care and I am waiting to finish off these batch of pads before starting them. Where have I been?! I didn’t even know Whamisa made pads. forgot to add – I have reviewed in the past, Neogen’s pads at my blog – the black gold caviar and the green caviar (which the former does have roe but the latter does not – the caviar is the seaweed name) I found both of them to be VERY moisturizing – dewy. I used those at night time when I had them. I’m all about dewy (and thanks for mentioning that the green isn’t actually caviar). I’ll check out that review. OOOh I’ve been interested in this…well anything by COSRX really, love that brand! I’ve tried the neogen peeling pad which is pretty good but not something I ever work into my daily routine! COSRX definitely fills a needed niche in the market. I haven’t tried the Neogen pads, but I’m sort of on a low-exfoliation kick right now. Oh, man I don’t think I’ve ever been disappointed by a CosRx product. And I’ve tried a good portion of their line. Guess this will have to be on the wishlist, right below the neon pads that I still haven’t gotten around to picking up yet! Also kind of crazy that these pads have propolis AND hyaluronic acid. Two of the three things my skin enjoys the most! Do you think this is better than the One Step Pimple pad? A lot of Korean beauty youtubers say that this one is better compared to the other one, but honestly I’m still confused when to use this in the skincare routine. It’s one of those products that can replace toner and serum (maybe even moisturizer if you’re very oily), and at the same time, it’s light enough that you can still use essences, serums, and moisturizer on top if you wanted. Unfortunately, I haven’t tried the pimple one, so I don’t know how it compares. Okay! Thank you so much for the information and I hope that you have the chance to try the pimple one to have something to compare to.